Abstract: The purpose of this study is to compare two different Computer Assisted Qualitative Data AnalysiS (CAQDAS) packages (NVivo and MAXQDA) on a specific aspect. The same data from an auto-photographic study is analyzed using the same approach to make the comparison. The comparison is not based on a data oriented evaluation, but the methodological approach used constitutes the basis for the evaluation. The criteria for the evaluation of these tools are: closeness to the data, ease of coding and memoing, and the interrelationship among the data, code and the memo which were derived from the methodological approach. The first level coding process was accomplished using Grounded Theory Methodology (GTM) with two different CAQDAS packages. 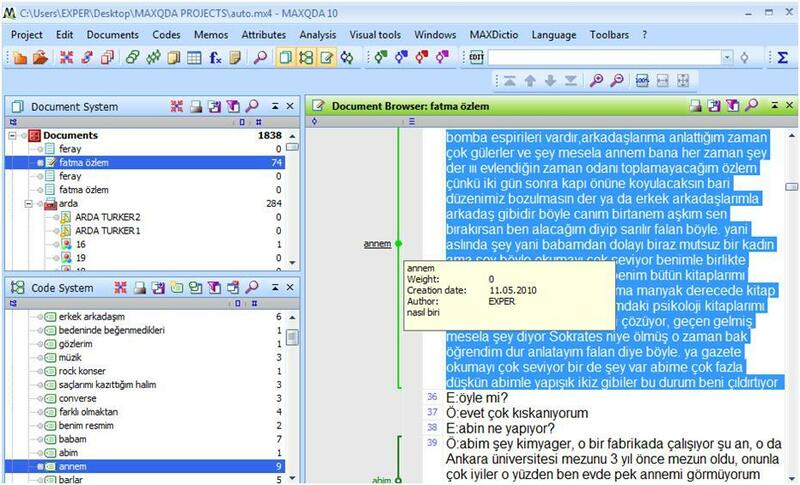 As for the result, in the GTM interpretation is crucial and MAXQDA supports the interpretive style better than NVivo. As for the memoing, both offer several tools and these tools have different names. The memoing tools available in these packages are listed in Table 1. 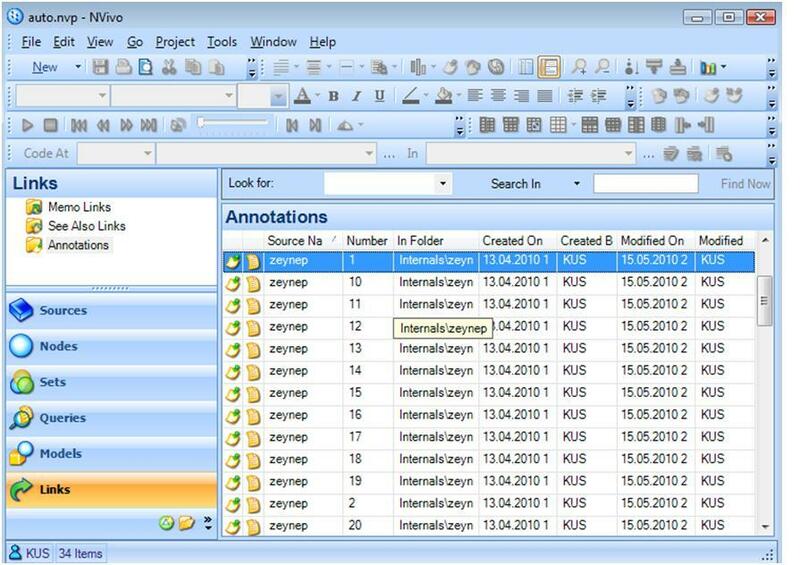 In NVivo, the Detail View Window is used for browsing data sources (documents, pictures, audio or video files). So, the first step is to open the data source and then start reading and coding. During the coding process, you have the category (node) list in the List View window which can be arranged to be at the left side of Detail View. It is also possible to arrange the interface: by hiding areas. When we look at the MAXQDA interface, we see four windows: Document System, Document Browser, Code System and Retrieved Segments windows. Here also, it is also possible to arrange the interface by hiding some of the windows. In MAXQDA when you decide to code a segment of the text you select it and right click on it. Through this way the contextual menu is opened, including the two options for coding: "Code in-vivo" or "Code with a new code" (Fig. 4). But it is difficult to catch the right node when the node list is long. 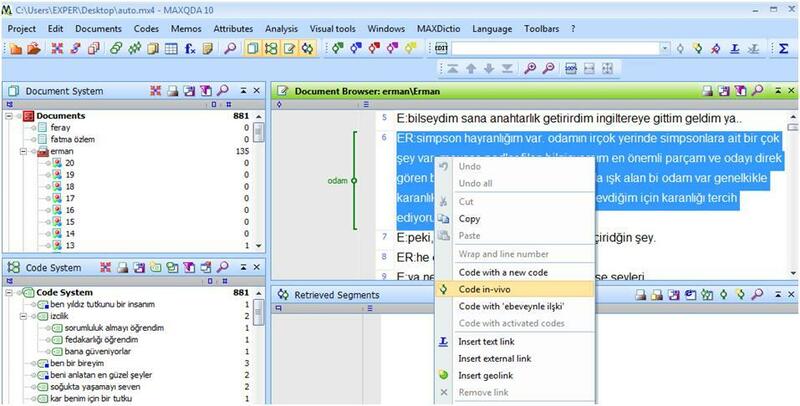 Another option is to use the Coding Tool Bar (Fig. 5). After you select the related data segment, you can select the node from the Coding Tool Bar and click on the "Code" icon. One more option is to use the "Code" menu from the main tool bar. 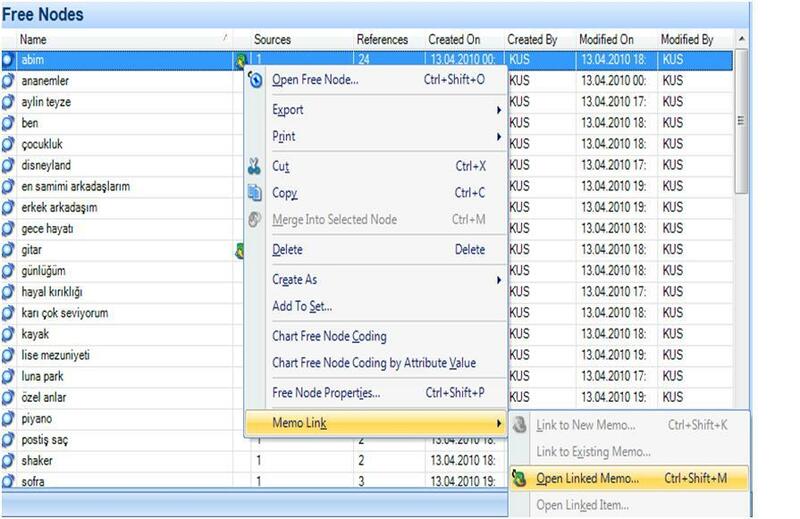 After you select the related data segment, you click on the "Code" menu and go through the contextual menu and click on the option "Code Selection / At Existing Nodes ..." . When you click on this option, a Dialog Box will open with the list of all created nodes (Fig. 6). On this Dialog Box, you can select the node or nodes you want to code. This Dialog Box for coding is quite useful especially when you want to quickly apply several codes to one segment. By just clicking on the related code, you will see it in the Coding Tool Bar. Now, you can select the related data segment and you can click on the "code" icon available on the Coding Tool Bar (Fig. 7). From the architectural point of view, the interaction between the Code System (CS) Window and the Coding Tool Bar is quite effective: whenever you click on a code on the CS Window, that code appears on the Code Bar. 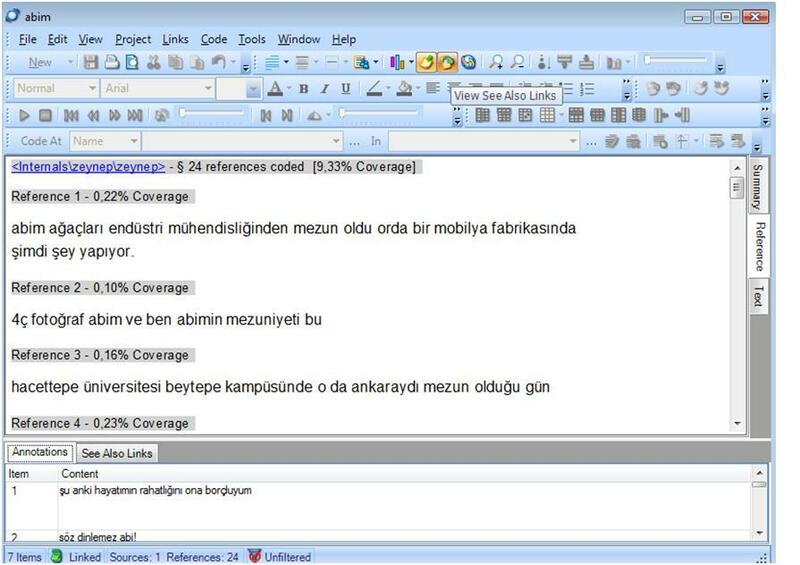 In NVivo, you can create a memo for a code or for a data source. In addition you can use the "Description" in the "Node properties" dialog box to write your definitions or thoughts. At any moment, you can right click on an item (e.g. node, source) and select "Memo Link / Link to New Memo" from the contextual menu (Fig. 13). The "New Memo" option is also available when you select a data segment and right click on it (Fig. 8). As mentioned before, linking a memo to the node or the data source links to the entire item, not to a segment of it—even though you choose to link the memo by selecting a data segment. If you want to attach your memos just for a specific segment of your data, you can create a link to your notes which is called "Annotations" (Fig. 10). The Annotation will appear like a footnote at the end of the data source or node. In my view, "See Also Link" functions better when you create a link between two different data segments. You can select a data segment, right click on it and select the "Copy" option. Then you can select the other data segment that you want to link, right click on it and select the "Paste as See Also Link" option (Fig. 11). The linked segments will be highlighted in red so that wherever you see the segments (in the original context or in the coded context) they will function as a reminder for you. When you create a memo, the memo icon appears on the left margin of the selected segment. You have different options to visualize your memo icon, which is quite useful for classification purposes (Fig. 12). The memo is opened as a dialog box and this makes you feel close to the data because, the data source and the memo dialog box are both in use simultaneously. Besides, you can read what is inside your memo just by putting your cursor on the memo icon (hovering) displayed at the left margin of the selected data segment (Fig. 13). You can also open your memo by double-clicking on it, so that you can also edit it if you need to do so. MAXQDA offers another reflexive tool called "Comment." This tool is to add short notes to individual code assignations. When you are working on your data source, each time you create a code, the code symbol appears at the left margin of your data source. It displays each code assignment. To add your comment, you double-click on the little circle in the middle of the code symbol, then the dialog box appears . After you write your comment about the code, the little circle in the middle of the code symbol becomes filled. Thus, whenever you see a code symbol with a filled circle, you can just put your cursor on it and display your comment (Fig. 14). 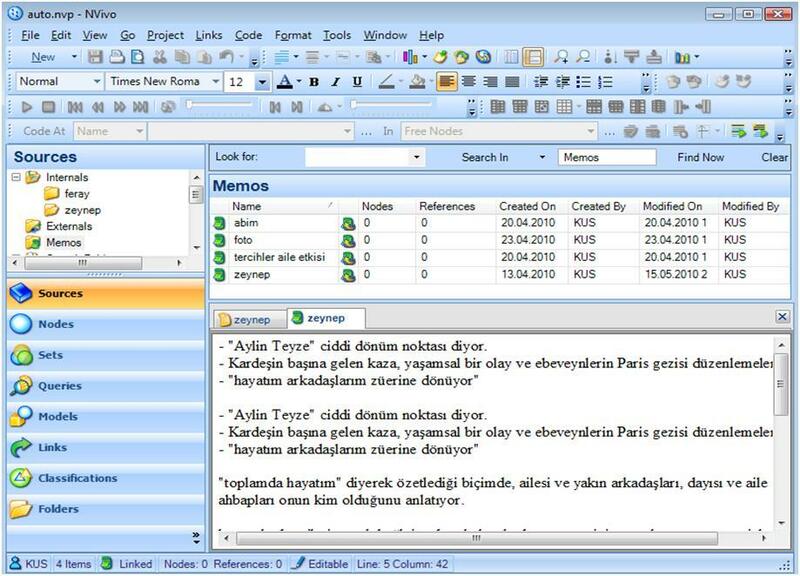 In NVivo, the List View of Nodes also displays the memos linked to each node. To open the linked memo, you must right click on the item and select the "Memo Link / Open Linked Memo" option from the contextual menu (Fig. 15). Remember that, linked memos are not for a specific segment inside the node; it is for the entire node. 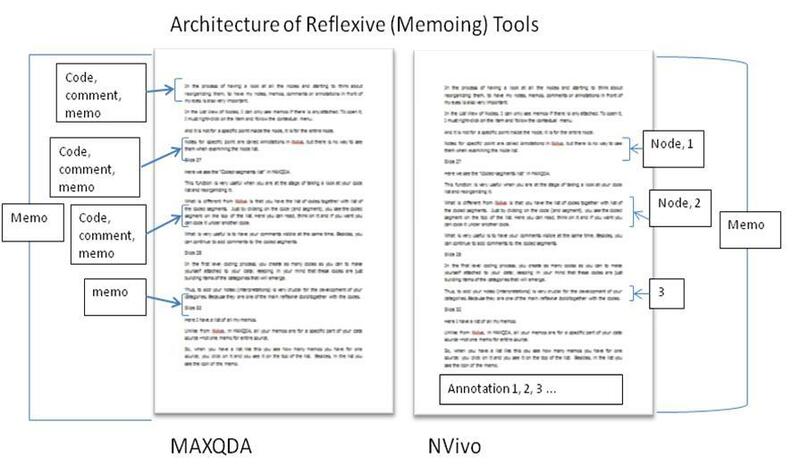 Notes for a specific segment held in Annotations in NVivo cannot be seen when examining the node list. To examine node content inside your project, you can just double-click on a node. 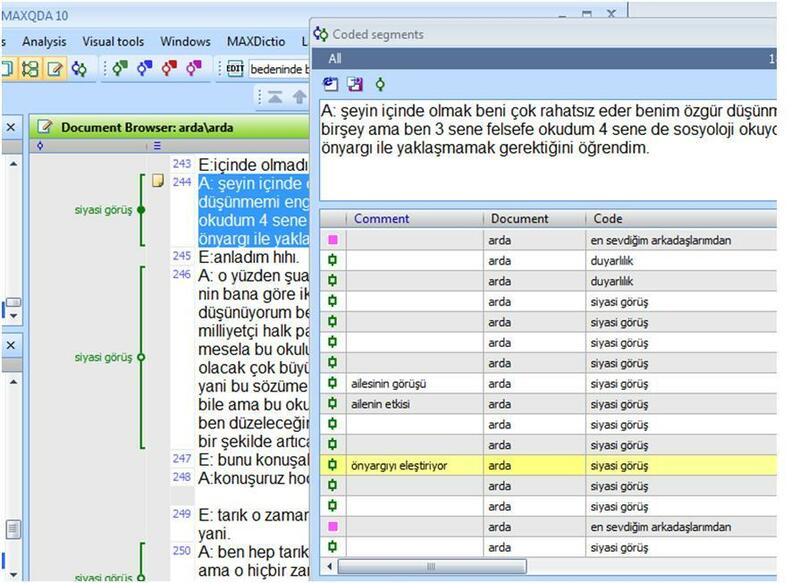 NVivo will display the coded content of the node in the Detail View Window. To display the coded content inside your project is better when you are at the stage of checking, thinking and recoding. 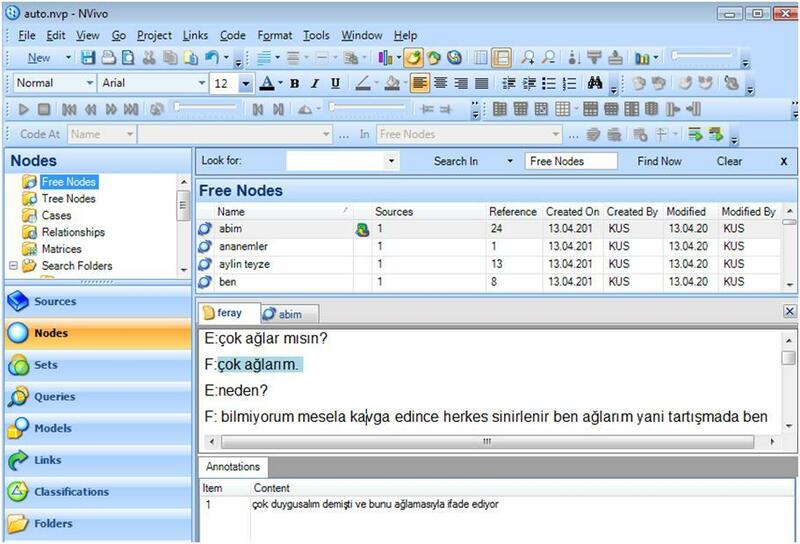 The linked memo for the node will be opened in the project window of NVivo. To read (or edit) it you can jump into the project window. To see your annotations and See Also Links inside the node, you can click on the "View" menu on the main tool bar and select to view both. Thus, you will see both the linked annotations and the See Also Links at the bottom of the node window (Fig. 18). 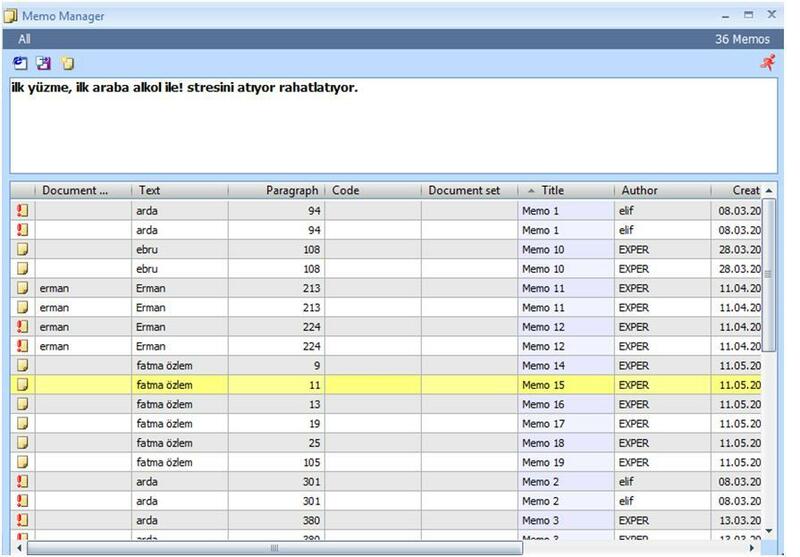 By just clicking on them, NVivo will display their location (linked data segment). When you want to see all your linked items (memos, annotations and See Also Links), you can open the "Links" file content. All the linked items will be listed in the List View Window (Fig. 18). In MAXQDA, the best way of examining your code list is to click on the "Codes" button on the tool bar and to select "Overview of Coded Segments." The Coded Segments Window will be opened (Fig. 19). 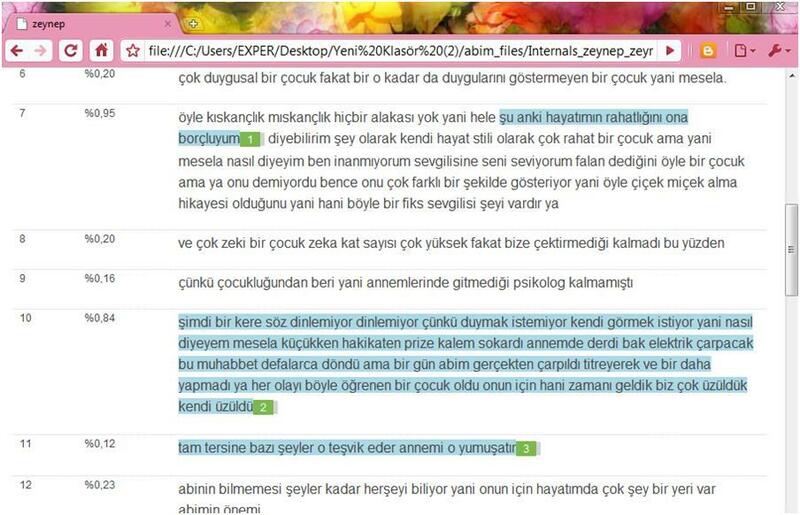 Here, you see which code is from which data source, the coded segments inside each code and the Comments. The coded segments of each code have a Preview column and when you click on a code segment, the whole segment is displayed on the top of the window. Memos are not displayed in the Coded Segments Window, but all the Comments are displayed. Moreover, you can add or edit Comments in this Window. If you are doing Grounded Theory, the Coded Segments Window is a unique tool to help you find the core category. This is because you have a table view of all coded segments with the Comment for the code. More clearly, your data, your code and your Comment are available to you simultaneously, which makes it very practical to reflect on (reread, recode, etc.) the coded segments. When you click on one segment to display what is inside, MAXQDA displays this segment in its original context automatically in the Project Window. If you have a big screen you can display the two MAXDQA Windows simultaneously (Fig. 20). This means, you also have your Memo (if that segment has one) at hand. You can reread or edit, your memos, comments, data and your codes in a very interactive and very user-friendly way. When you want to see the list of all your memos, you can click on the "Memos" button on the tool bar and select the "Memo Manager" option. Again, a new window will open to display all your memos with their symbols, preview, linked data segment, etc. (Fig. 21). Here you can click on a memo to display what is written inside. MAXQDA will display your memo in its original location in the project window. 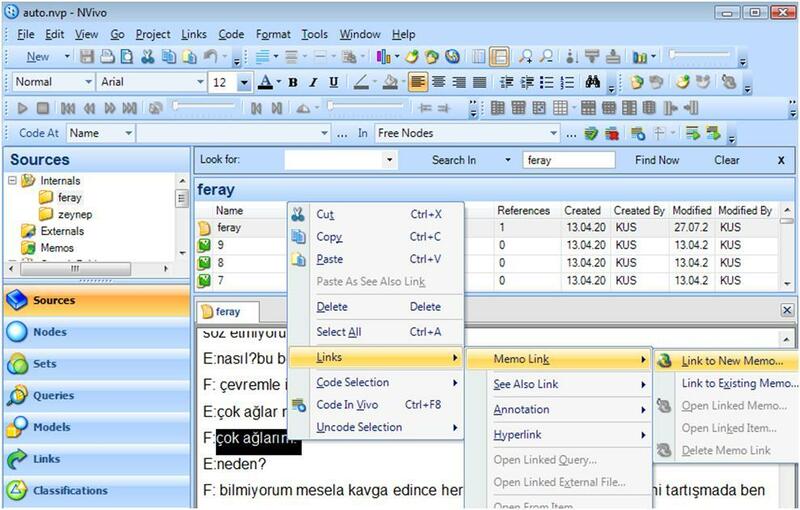 Stating the importance of memoing as well as coding, I compared NVivo and MAXQDA open coding and memoing tools. Both of them offer similar tools for reflexive thinking or memoing. The main difference between them is the architecture of these reflexive tools (Fig. 22). In this article, I haven't given any specific example to show the contribution of MAXQDA on my GTM analysis. But I would like to emphasize that in general, MAXQDA motivated me to interact with my data as much as I can through its easy and interactive design. Charmaz, Kathy (1983). The logic of grounded theory. In Robert Emerson (Ed. ), Contemporary Field Research: A collection of readings (pp.109-126). Boston, MA: Little, Brown. Coffey, Amanda; Holbrook, Beverley & Atkinson, Paul (1996). Qualitative data analysis: Technologies and representations. Sociological Research Online, 1(1), http://www.socresonline.org.uk/1/1/4.html [Accessed: September 25, 2010]. Dollinger, Stephen J. & Dollinger, Stephanie C.M. (1993). Identity, self and personality: II. Glimpses through the autophotographic eye. Journal of Personality and Social Psychology, 64, 1064-1071. Dollinger, Stephen J. & Dollinger, Stephanie C.M. (1997). Individuality and identity exploration: An autophotographic study. Journal of Research in Personality, 31, 337-354. Fielding, Nigel & Lee, Raymond (2007). Honoring the past scoping the future. Paper presented at CAQDAS 07: Advances in Qualitative Computing Conference, Royal Holloway, University of London, 18-20 April. Glaser, Barney G. with the assistance of Judith Holton (2004). Remodeling grounded theory. Forum Qualitative Sozialforschung / Forum: Qualitative Social Research, 5(2), Art. 4, http://nbn-resolving.de/urn:nbn:de:0114-fqs040245 [Accessed: August 12, 2008]. Kelle, Udo (1997). Theory building in qualitative research and computer programs for the management of textual data. Sociological Research Online, 2 2), http://www.socresonline.org.uk/2/2/1.html [Accessed: July 1, 2009]. Lewins, Ann & Silver, Christina (2007). 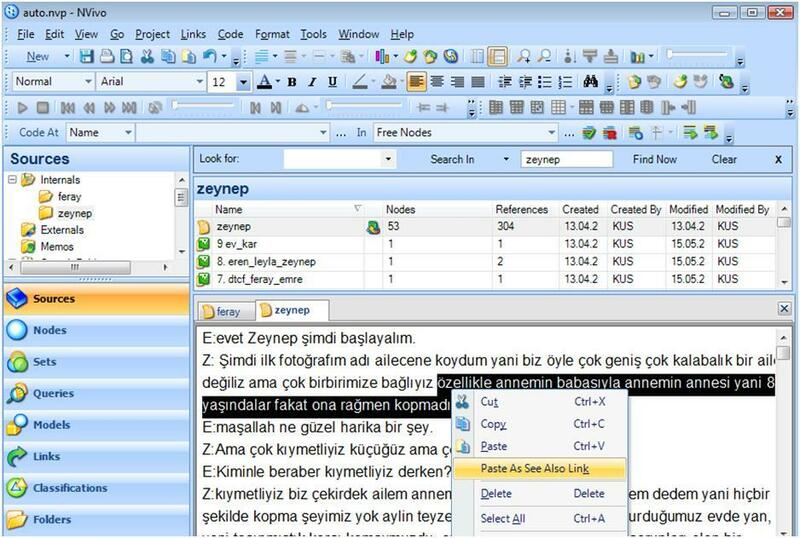 Using software in qualitative research: A step-by-step guide. London: Sage. Noland, Carey M. (2006). Auto-photography as research practice: Identity and self-esteem research. Journal of Research Practice, 2(1), Article M1, http://jrp.icaap.org/index.php/jrp/article/view/19/50 [Accessed: January 15, 2007]. Ziller, Robert C. & Lewis, Douglas (1981). Orientations: Self, social and environmental percepts through auto-photography. Personality and Social Psychology Bulletin, 7, 338-343. Ziller, Robert C. & Smith, Dale E. (1977). A phenomenological utilization of photographs. Journal of Phenomenological Psychology, 7, 172-182. Elif KUŞ SAILLARD is a sociologist at Ankara University. She has been using qualitative data analysis software since 2002. She published two books about the use of software in qualitative data analysis. She is teaching NVivo and MAXQDA in workshops.